Ain't nobody got time for makin' every ingredient from scratch. 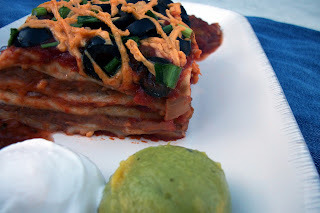 I was able to simplify and revamp the recipe using Daiya Deliciously Dairy-Free shreds, canned tomatoes and beans. I've been making it for years, and the family loves it. Dare I say it's nearly as good as the scratch-baked version? In a medium pan, cook bell pepper and onion with water over medium heat until vegetables are soft, and water is absorbed. Add cane juice crystals or natural sugar and continue to cook for two minutes, caramelizing onions. Add diced tomatoes, tomato sauce, tomato paste, garlic powder and black pepper. Mix well and cover. Reduce heat and simmer for 10 minutes, stirring occasionally, then remove from heat. Set aside. In bottom of an oiled 9-inch by 13-inch casserole dish, spread one cup of Enchilada Sauce. Arrange five half-tortillas over top of sauce. 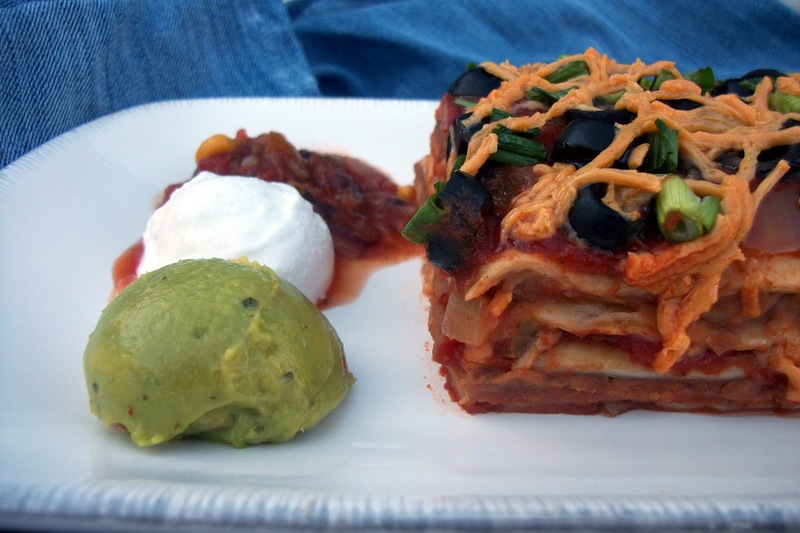 Spread one can of vegetarian refried beans over top of tortilla layer. Arrange five more half-tortillas over the top of the beans. 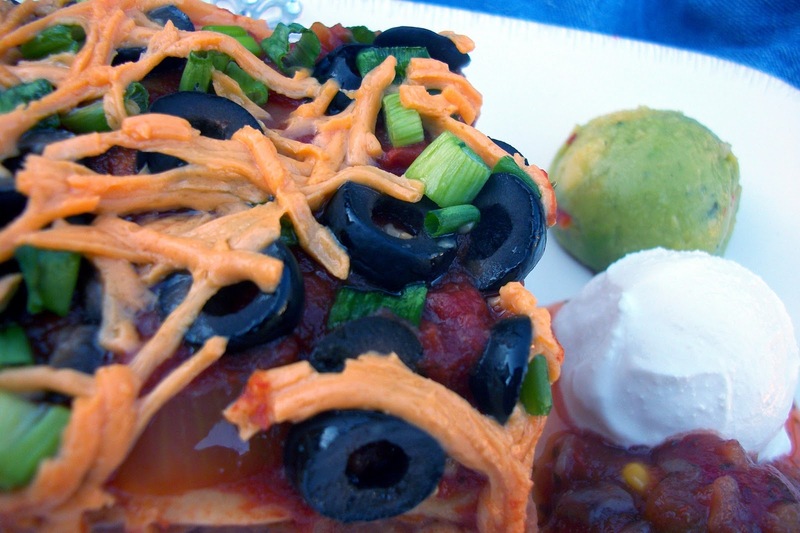 Spread a cup of Enchilada Sauce over the tortillas, and sprinkle half a cup of "cheese" shreds over the sauce. Add another five half-tortillas, and spread the second can of refried beans over the top. Add another layer of five half-tortillas. Pour another cup of Enchilada Sauce over the last layer of tortillas, then scatter drained olives and sliced green onions over the top. Remove from oven, remove foil and sprinkle remaining half cup of "cheese" shreds over top. Return to oven, uncovered, for 15 minutes to melt "cheese." Remove from oven and let stand for about 10 minutes before slicing and serving. Garnish with guacamole, salsa and vegan sour cream, if desired. Perfect timing! 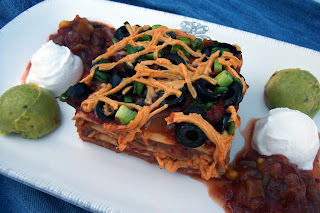 I was just thinking of what to make for dinner and enchiladas popped into my mind and I started searching for a Vegan recipe and there you are!